The lander MASCOT will land on Ryugu within the ellipse-shaped landing site MA-9 marked in blue. The Japanese Hayabusa2 space probe will approach the asteroid’s surface and take samples from the areas L07, L08 and M04. The MINERVA rovers were deployed at the landing site N6 marked in red. Credit: ©JAXA, University of Tokyo & collaborators.. The Hayabusa2 probe will descend to the asteroid Ryugu for sampling in the L08 area near the equator. L07 and M04 are the replacement sites. Credit: ©JAXA, University of Tokyo & collaborators. 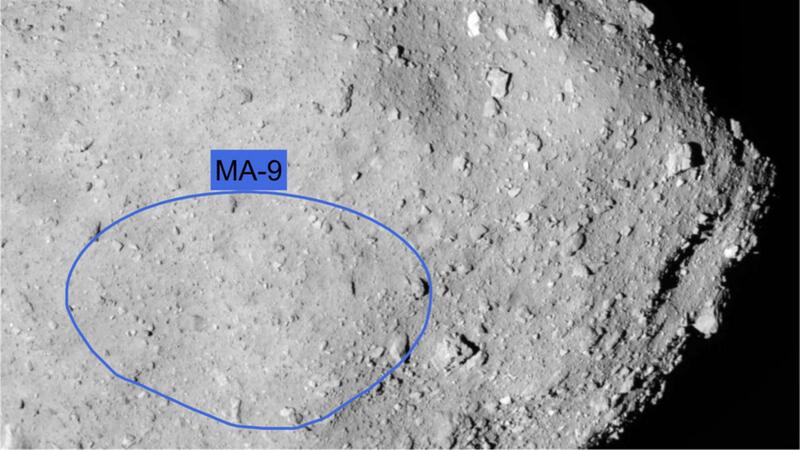 At this moment, the landing site, located at 315 degrees east and 30 degrees south, is still simply called 'MA-9'. Landing scheduled for 3 October 2018. Not too hot and not too cold. Not too many boulders, nor too few. Easily accessible and scientifically exciting. Meeting the requirements that the Mobile Asteroid Surface Scout (MASCOT) team had for the landing site on the asteroid Ryugu was no easy task. "However, we have now decided on an almost perfect landing site," says Ralf Jaumann from the German Aerospace Center (Deutsches Zentrum für Luft- und Raumfahrt; DLR) Institute of Planetary Research, who is Principal Investigator of the MASCOT landing probe and responsible for the lander's MasCam camera experiment. DLR Project Manager Tra-Mi Ho is also satisfied with the selection of the landing site: "For the operation of our lander, the chosen landing site was among the favourites from the very start." In consultation with more than 100 international and national partners, the MASCOT landing site was selected from 10 potential candidates, and announced on 23 August 2018. MASCOT's landing is scheduled for 3 October 2018. 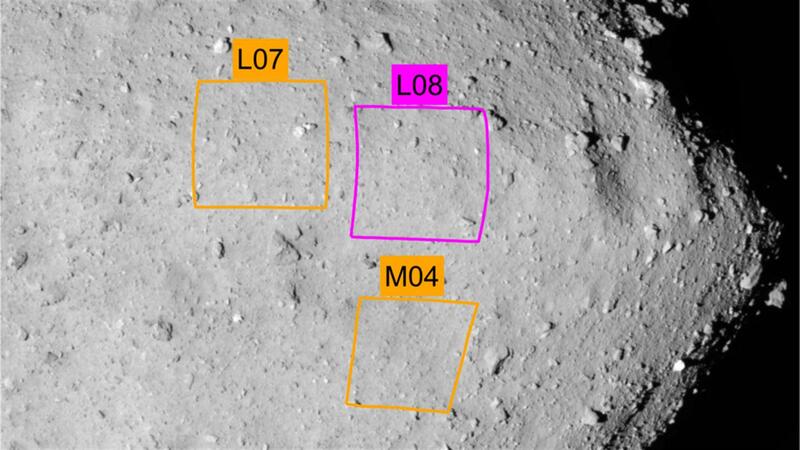 The locations at which the Hayabusa2 probe is expected to take soil samples have also been designated, as have the sites where the three MINVERVA-II rovers will be placed on the asteroid's surface. Located at approximately 315 degrees east and 30 degrees south, the place at which MASCOT is supposed to land on the primordial celestial body and carry out measurements on the asteroid's surface using four instruments is, at the moment, still simply called 'MA-9'. The landing site area has several advantages. Firstly, it is far enough from the regions in which Hayabusa2 will descend to the surface and take soil samples – in this way, MASCOT and Hayabusa2 will not get in each other's way as they perform their activities. 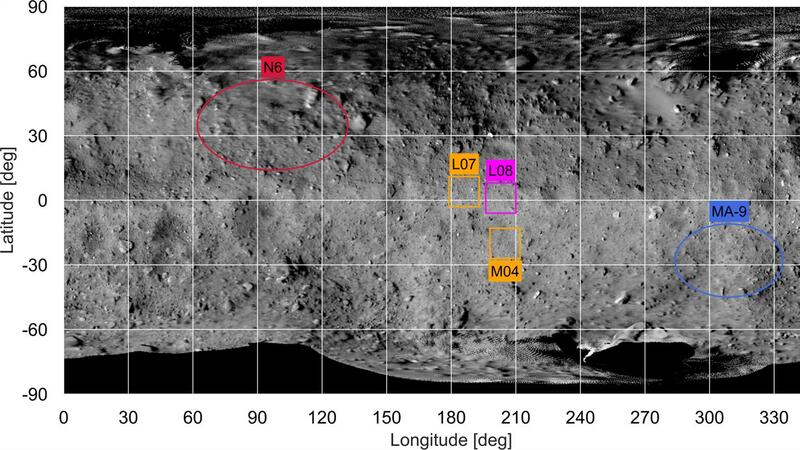 Secondly, the landing site lies in Ryugu's southern hemisphere, so with the data collected by Hayabusa2 at the equator and MINERVA in the northern hemisphere, scientists will be able to gain good coverage of and investigate the 950-metre-diameter asteroid. Temperatures are expected to reach up to 47 degrees Celsius during the asteroid day and drop to minus 63 degrees Celsius at night. This is in line with the desired framework conditions for the operation of the instruments and for the lander's battery. In the vicinity of the landing site, there are numerous boulders up to 30 metres tall, but the really big rocks are not located in the MA-9 region. Images acquired by the optical navigation camera on the Hayabusa2 probe indicate that the landing site area probably holds fresher material that had little exposure to cosmic radiation, the particle flow of solar winds, as well as interplanetary dust – and is therefore still very primordial and in an unchanged state. Making a final selection from 10 potential landing sites was not easy for the scientists and engineers. After all, every team of instrument experts should be able to get the working conditions and data that it expects. For example, the MicrOmega infrared hyperspectral microscope of the Institut d'Astrophysique Spatiale (IAS) would have preferred slightly cooler temperatures during the asteroid day. The MAG magnetometer of the Technical University Braunschweig would have favoured very large boulders for its measurements. By contrast, the MasCam camera and the MARA radiometer – both instruments developed by the DLR Institute of Planetary Research – enjoy almost ideal conditions for their scientific work because they have a view of boulders on the horizon and can examine fresh asteroid material. Ultimately, the conditions that the landing site offers are very favourable for the lander and all instruments on board. "From our perspective, the selected landing site means that we engineers can guide MASCOT to the asteroid's surface in the safest way possible, while the scientists can use their various instruments in the best possible way," says Tra-Mi Ho, Project Manager at the DLR Institute of Space Systems. "But we are also aware: there seem to be large boulders across most of Ryugu's surface, and barely surfaces with flat regolith. Although scientifically very interesting, this is also a challenge for a small lander and for sampling."